The Happiest Music Festival's ninth year begins with stellar performances by Poets of the Fall, Guthrie Govan, Tipriti Kharbangar & The Clansmen and more. Bacardi NH7 Weekender 2015 opens in Shillong! 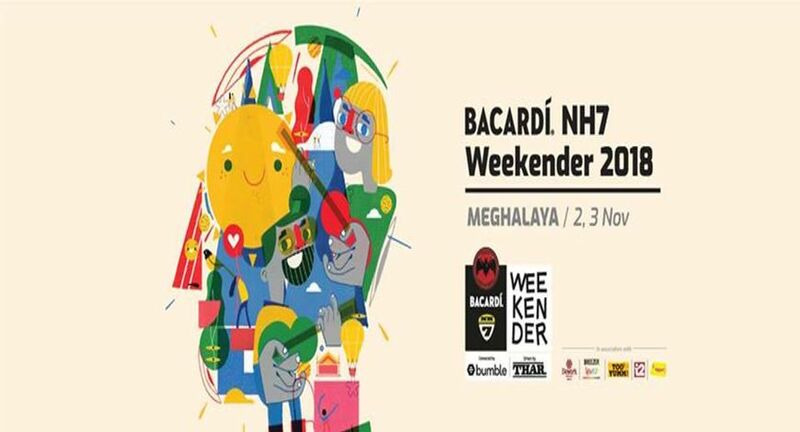 Bacardi NH7 Weekender, the country's largest multi-genre music festival, returned to Meghalaya on 2nd November 2018 at the beautiful 'Wenfield' - The Festive Hills, Thadlaskein, Lad Mukhla, Jaintia Hills. One of the most anticipated events in India, the festival was once again welcomed by thousands of music fans, who thronged to see their favourite acts and discover new music. The day was headlined by the much awaited Finnish alt rock band Poets of the Fall (on-tour with their eighth studio album Ultraviolet), which played to a huge passionate crowd. Day 1 also saw strong performances by guitar virtuoso Guthrie Govan who performed with Mohini Dey and Gino Banks, and Israeli psychedelic post-rock act Tiny Fingers. Some of India’s most populat acts also took the stage, such as Dualist Inquiry, Scribe, Kumail (Live) and Sandunes Live, acoustic folk jam band Fiddler's Green, singer-songwriter Mahesh Raghunandan, fusion act Shadow and Light, and vocalists Abhilash Choudhury and Aditi Ramesh. A special set was also played by Zubeen Garg as a tribute to Bhupen Hazarika, both being beloved musicians of the North East. And speaking of the North East, local artists shone at the festival: Tipriti Kharbangar and the Clansmen, Summersalt, adL x k.ly & The Other Soul Collective from Meghalaya, The Pirates from Assam, The Twin Effect and Avancer from Nagaland, The Vinyl Records from Arunachal Pradesh. Day 2 of the festival features American alternative-rock band Switchfoot, a crowd favourite. Day 2 will also see the much loved Bollywood composer Shankar Mahadevan (who will be performing his set My Country, My Music) and carnatic classical musician TM Krishna ,rock-electronica act Pentagram and veteran rockers Zero. Other upcoming performances include the prodigal bassist Mohini Dey who performs her own set, Ape Echoes, The Yellow Bucket, Whale in the Pond. Ritviz Komorebi, Aarifah Rebello, Mali, and Morning Mourning. The festival grounds also saw a vibrant bazaar with shops displaying and selling fashion, accessories and local finds. Food stalls catered to various tastes, and were a great way to check out a lot of local cuisine, specially for fans traveling from outside the region. Before the day’s music began, Thar owners enjoyed an offroading session at a special Thar Adventure Zone created just outside the festival venue. The setting of the festival, the proximity to the Thadlaskein Lake and the hilly region made it a fantastic day 1 to remember, with fans clamouring for day 2.